Posted on Wednesday, June 18th, 2014 by Innovate. 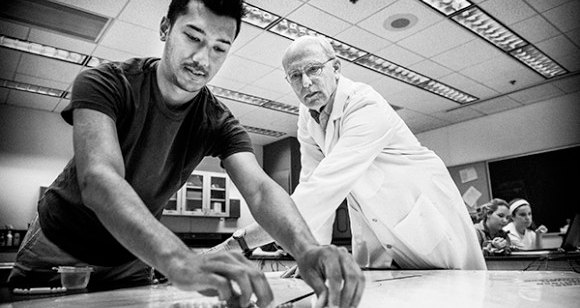 Dr. Bruce Kirchoff, a UNCG biology professor known for his innovative approach to teaching that encourages students to see patterns in their mind’s eye through active learning, appears in UNCG’s BIO active Learning site . Kirchoff’s work with visual learning has led him to become an entrepreneur. With advice from the UNCG Office of Innovation and Commercialization, he created the business Metis LLC to expand the reach of his valuable learning aids. From a prototype created for Stanford Medical School to classes at Australia’s Charles Sturt University, students in various parts of the world have used the software. This year the UNC Board of Governors presented Kirchoff with its Teaching Excellence Award and, in February, Metis was named one of 40 worldwide semifinalists in the Elance Big Idea Start-Up competition.